At times infrared spectra show prominent CO2 bands in the MIR region which might pose problems when processing the spectra. The atmospheric compensation tool allows a preprocessing of the data where the peak can be removed using two different approaches: the user can either replace the peak by an interpolated straight line or select to apply a model which is used to compensate the peak. For both techniques the first and last layer of the interpolated region can be selected. The intensity of each of the two pivot points is determined by the mean of k neighboring values, which can be specified by the user ("# Nb." control). Replace by a straight line: In this method the peak is replaced by the values of the linear baseline that spans the space between the two pivot points. Apply a model: Using this approach the user first has to calculate a model of the peak by clicking "Calculate Model". The resulting CO2 template peak is then displayed in the model chart. The template is derived by calculating the average spectrum of the CO2 peak with respect to the linear baseline between the two pivot points. In order to speed up this process the "# Smpl." 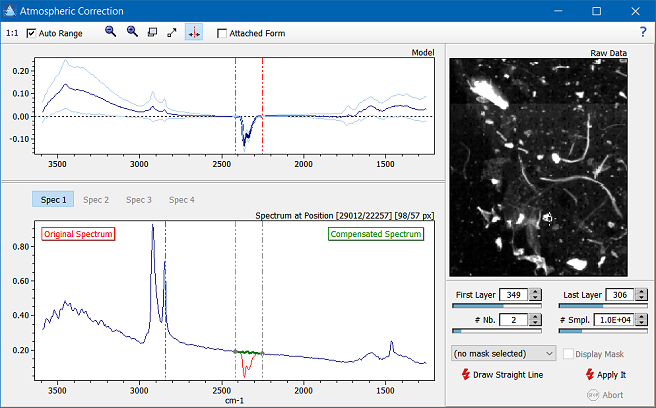 control restricts the number of spectra used in the calculation. The spectral chart now shows a preview where the user may assess the quality of the compensation by moving the cursor in the raw data plot. The original spectrum is displayed in red and the compensated spectrum in green. The atmospheric compensation is achieved by performing a simple linear regression between the values of the template peak t and the actual CO2 peak s of the spectrum. The obtained regression coefficient β is then used to subtract the template peak from the spectrum following c = s - β * t, where c is the compensated spectrum. If the preview is satisfying the user can apply the compensation by clicking "Apply It". Hint: The image masks may be used to restrict the operations of the Atmospheric Compensation tool to certain areas of the image. In the case of the model compensation the user can use one mask for calculating the model and another or no mask for compensating the peak. This approach might be useful if the CO2 peak is superimposed with a peak from another chemical compound in certain areas of the image. Using only the "clean" CO2 peaks might then improve the compensation.